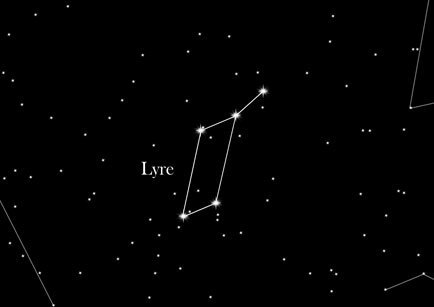 The Lyre is a small but distinctive constellation, which can easily be seen on the summer and autumn sky. The Lyre is on the northern hemisphere. One can find this constellation rather easily, especially when you know that the lyre is north of the Milky Way. The name of the constellation Lyra comes from an ancient stringed instrument, which is also called lyra. The Lyre has the form of a uniform parallelogram, the strings of a lyre. At its very bright main star, Vega, the lyre is very beautiful to see. This is the second brightest star in the northern hemisphere and the fifth-brightest star of entire night sky. The lyre is north of the Milky Way and is already relatively easy to see. In this constellation there can be many different galactic clouds at different brightness levels. The stringed instrument lyre, is said to have been invented by Hermes, the Greek god. This musical instrument was given to Apollo, his half-brother. Apollo was later called Orpheus, the famous singer with the instrument. Orpheus with the lyre beguiled the god of the underworld Hades to rescue his bride Eurydice from the underworld. Eurydice was killed by a snake bite. However, when leaving, Orpheus disobeyed the commandment of the underworld, not looking back. He died, and at his death the lyre was placed at the sky in his honour. Eurydice remained in the underworld.